Established in 1999, it has considerable experience in recruiting and placing high calibre personnel in various business sectors of Ghana economy. By delivering a dedicated and professional service at all times, the basis is established for developing a mutually beneficial business relationship with employers and Applicants. 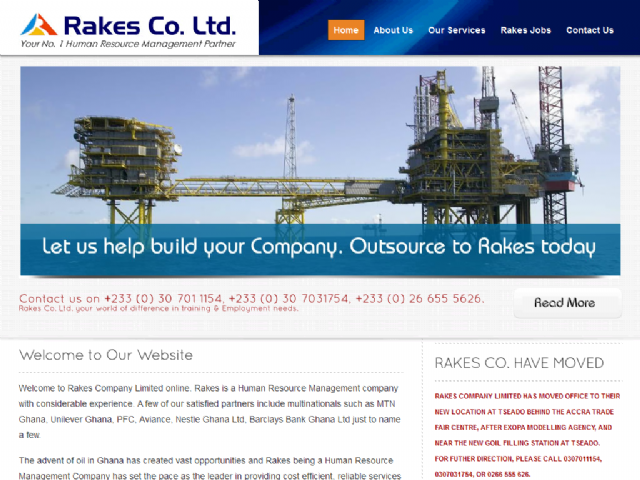 Rakes tends to be fairly well connected with Ghanaian industry players thus giving us an edge when it comes to finding new jobs for the right clients. Rakes is among the leaders in the wave of the future; Outsourcing. We handle certain internal company functions of some of our clients to save money, improve quality, or free company resources for other activities. ome of our happy clients are Multinational Companies and local enterprises like Unilever, PFC, Aviance, Nestle, Guinness, MTN and Barclays Bank. Their total satisfaction stems from benefits derived from focusing on their core business and letting Rakes professionally manage their workers, providing worker motivation i.e. prompt salaries and welfare packages.